A New Green Twist on an Old Vermont Tradition! The woods have been and continue to be managed by a forester. In keeping with our commitment to preserve the environment, make best use of our land and foster sustainability, our goals are to preserve healthy trees and promote optimal growth and productivity of the sugarbush. The trees that are harvested are used to heat our sugar house and fire our woodburning evaporator to make our maple syrup. We have approximately15,000 taps on our 200 acres of land and another 8,000 in two other sugarbushes in Lincoln . All of our tubing and mainline is food grade – which means it is made from “virgin” plastic and not recycled bottles and other plastic materials. The motors on our four vacuum pumps are energy efficient because they have “slow-start” motors which allows them to run at a slower pace when not needed and alleviate huge power surges when starting up. There are 25 vacuum boosters in the woods that aid in maximizing sap production without damaging the trees. Two sap extractors (one for each side of the woods) in the sugarhouse capture the sap from mainlines in the woods and pumps it into the three holding tanks while waiting to be run through the reverse osmosis machine. The main part of the sugarhouse is a timber frame from a glass shop, the siding is recycled barn board, the windows are energy efficient, and all the lighting is LED. 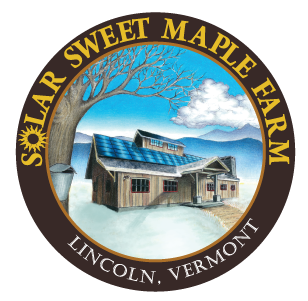 The placement of the sugarhouse was extremely important because we needed to position it to get the optimal southern sunlight for our 12.5 kw solar panels. Energy produced from the sun is used to power our entire sugarhouse. There are three holding tanks (two 7,500 and one 6,000 gallon) to store sap when it reaches the sugarhouse. When the weather conditions are just right these tanks will be full. We run the sap through our Reverse Osmosis (R.O.) machine which will take out 80% of the water in the sap before boiling. The water is piped into holding tanks and the concentrate (leftover sap to be boiled to make syrup) is sent to a separate tank. This machine will filter 6,000 gallons of sap in one hour. By removing most of the water from the sap, it significantly reduces the boiling time. Waiting in the main sugarhouse is our 5×14 wood-fired gasification evaporator. It’s made of stainless steel and has a preheater that warms the sap before being boiled (another energy saving feature). The gasification process is another efficient feature, it uses all the wood and ashes to produce the heat to boil the sap, in turn, using less wood. We expect to use approximately 40 cords of wood during sugaring season. Once the fire in the evaporator is started, it will be up to temperature within 15 minutes and we typically will have our first draw within half an hour. From there syrup is filtered and packaged.